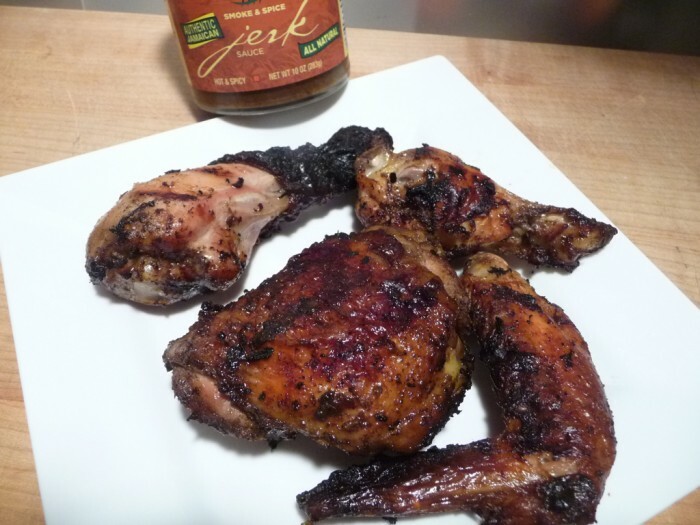 This made in America “Jamaican” Jerk Sauce is true to the flavors, heat and spices that are jerk. Let me say, right up front, that I think this is the best Jerk Sauce I’ve ever had from an American company. My only complaint is that is only comes in a small 10 ounce jar. I wish it was available in larger jars, say 12 – 16 ounces. Smoke & Spice Jerk from @BestJerkSauce is a fantastic blend that really delivers an authentic jerk flavor. This is NOT a jerk paste… I feel the requirements and qualities of a true paste are different. Jerk pastes are super thick and usually require some oil to be applied to help thin them out and spread the ingredients and flavors over the food (chicken, shrimp, pork) to be cooked. Heat Level: – Big hit of authentic heat. This will light you up! But with flavor, and the heat subsides fairly fast. It’s real jerk heat and flavor. Well balanced. Overall Flavor: – Our top rating! 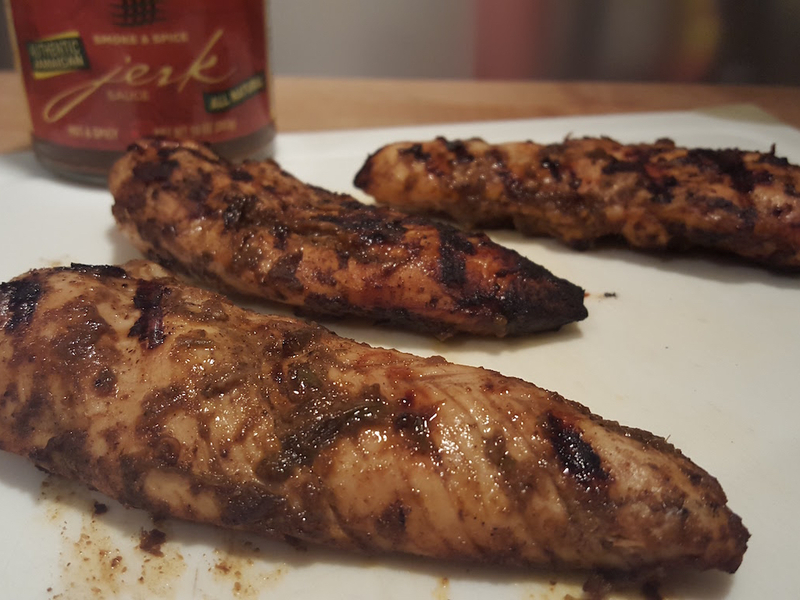 All of the flavors blossom nicely – a delicious jerk sauce. Amazing. Ingredients: Soy sauce (water, soy beans, wheat flour, salt, potassium sorbate (less then 1/10th of 1%)), fresh onions, tomato paste, fresh scallions, scotch bonnet peppers, fresh ginger, cane vinegar, water, brown sugar, fresh garlic, soybean oil, allspice, thyme and natural spices. Thick and coarsely ground, it’s a perfect consistency that sticks to your foods. Marilyn is not the big fan of jerk sauces that I am, but she likes that it has “♫ no stems or seeds that you don’t need ♫”. She’s referring to the tiny stems and twigs found in most dry jerk seasonings and some imported pastes and sauces (and to Cheech and Chong). Right up front, the soy sauce adds some dark flavor. I love the sweet warm heat of the Scotch Bonnet pepper (as compared to habanero). The onions and scallions add their sweetness to the mix along with some brown sugar. The required allspice and thyme are not over-bearing. 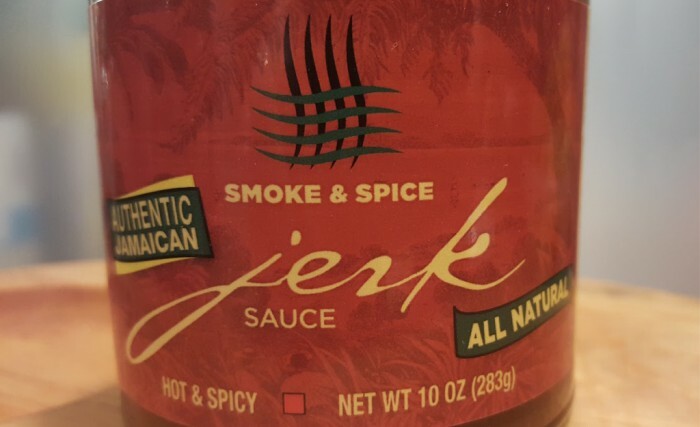 What a fantastic blend that really delivers an authentic jerk flavor. As I write this review, I’m eating the sauce straight up with a fork, and the fresh bright flavor and tempered heat are making me so happy to share this sauce review with you. Packaging: I mentioned the small 10 ounce jar. Perhaps Smoke & Spice will come up with a larger package someday. But no worries, it’s plenty for 3 or 4 dinners as it is. On food: Chicken, chicken and chicken. I would have liked to show some pics of jerk shrimp, but that’s in my future. And besides, shrimp is so dense, it doesn’t really absorb sauces or marinate well… with shrimp you just grill it. Chef Karin swears that her sauce makes a good dipping sauce or all purpose seasoning too. 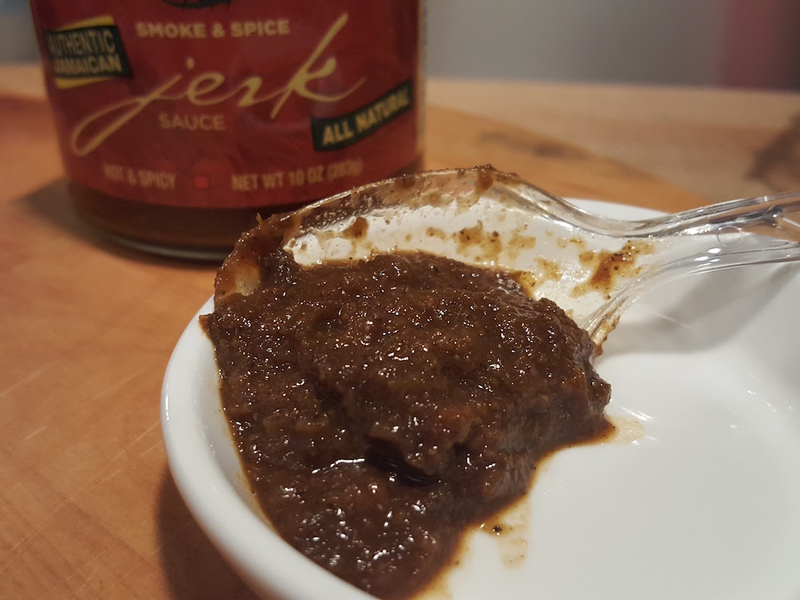 I’d love to hear your suggestions in the Comments below for using Jerk sauce this way. On chicken tenders it absolutely rocked. I marinated some chicken tenders overnight, grilled them up on the gasser, and they were fabulous. 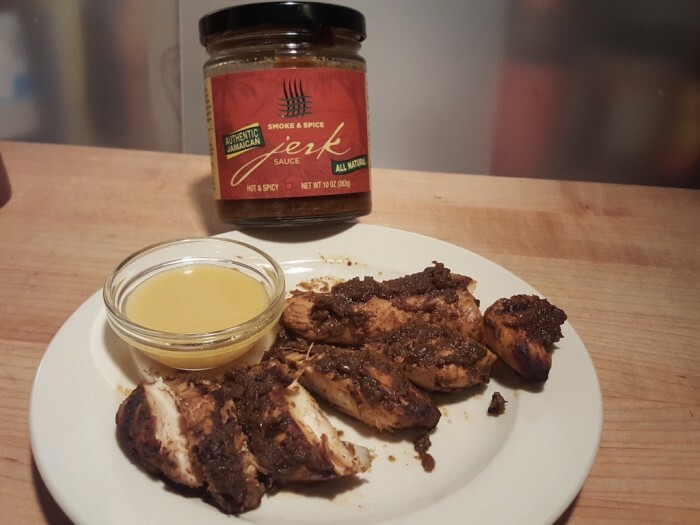 We had them with some honey mustard sauce from our local restaurant (Seacrets) and enjoyed the best flavors and spice from Smoke & Spice Jerk Sauce. We also marinated some chicken parts and grilled them over some charcoal… another stellar jerk chicken dinner. 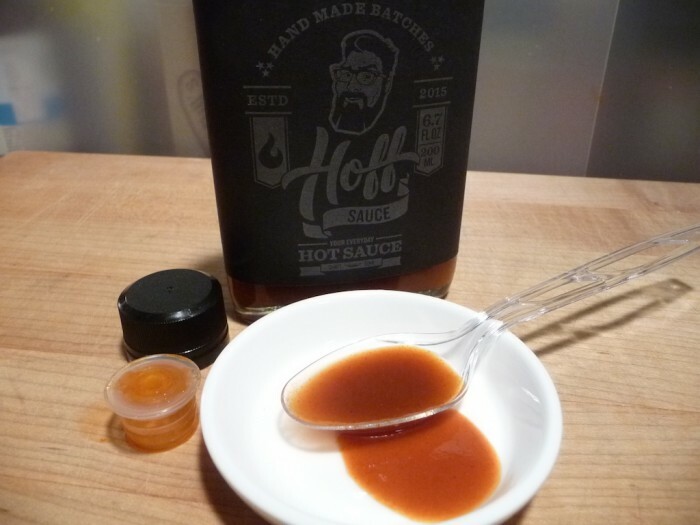 We first heard about Hoff Sauce when they were debuting their product at the Chattanooga (TN) Market in early August. Checkout the Giveaway at the end to win a bottle of Hoff Sauce! 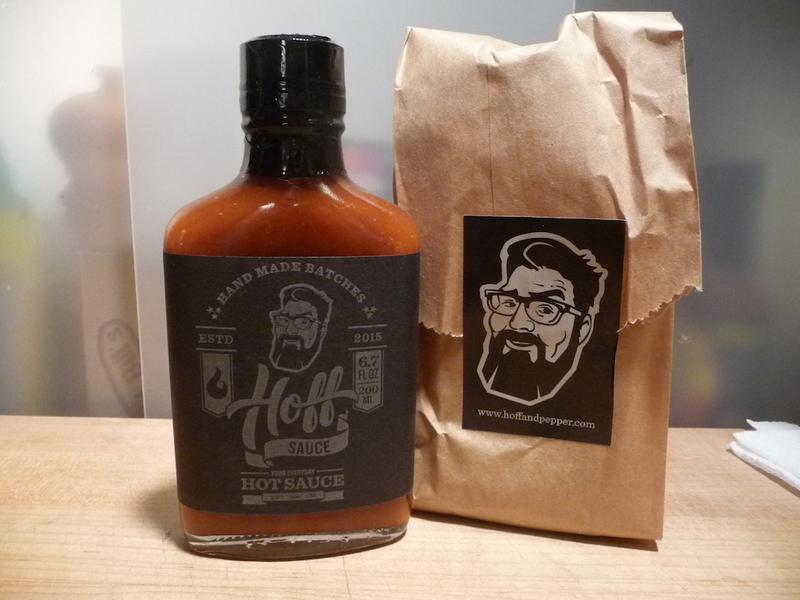 Packaged in a flask bottle and adorned with the cartoon likeness of founder and creator Aaron Hoffman, this sauce really piqued our interest. We just had to try it. And we are suckers for a flask bottle. Hoff Sauce – an everyday sauce that can be enjoyed by everyone. Or at least that is one of their taglines. And it may be true. But ultimately, this sauce is for fans of habanero sauces. Heat Level: – A nice sting of heat. Habanero happiness. Peppery flavor and fresh taste. Everyday. Ingredients: Chiles (Red Jalapeño, Habanero, Chipotle), Vinegar, Salt, Granulated Garlic. This thin sauce is unremarkable in appearance. It shows tiny bits of peppers, but that’s about all. An average sauce. Thin. Not much to say about the consistency. But it works. The flask bottle comes with a restrictor cap that we feel is not necessary. Let the sauce flow Hoff! Sharp heat – think kicked up taco sauce – followed by a strong garlic hit. This is one of those sauces that you “splash” on foods, as opposed to dripping onto, or pouring onto. The thin body of the sauce dictates so. I’m getting mostly a stinging heat from the habaneros and red jalapeños. The chipotle pepper, and it’s inherent smokiness barely comes through. It is very good on tacos, and pretty good on slices of pizza. Some might like it in their bowls of chili or cooked into their taco meat. A few drops onto nachos is pretty darn good too! Fantastic job with the flask bottle. I’m sorry the graphics don’t pop more from the label… Hoff really did a good job on that concept, but the graphics just don’t shine through. As a 5-year-old, Aaron Hoffman remembers skipping the Twinkies and Little Debbies and reaching for cheddar cheese and pickled jalapeños instead. He’s always been a fan of hot and spicy foods. As an adult, he has converted that passion for heat into his own brand of hot sauce called Hoff Sauce. 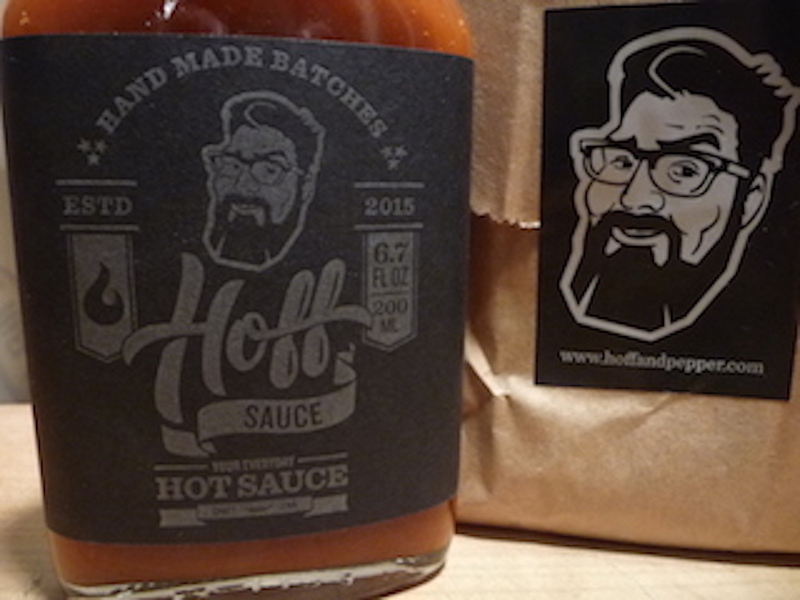 He and his wife, Michelle, created Hoff and Pepper Co. to market the brand. Disclaimer: We purchased this product for our own personal use and review purposes. The thoughts and opinions expressed are our own. Some compensation was received via the giveaway bottle.